Dirty Linen mentioned in Sing Out! | What happened to Dirty Linen? Dirty Linen mentioned in Sing Out! We’re thrilled to read Sing Out! 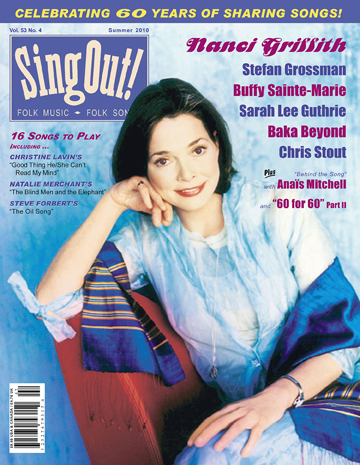 editor Mark Moss’s kind words about Dirty Linen in the latest issue of Sing Out! (Volume 53#4 — Summer 2010). While many considered us to be competitors or rivals, we felt that we were in the same leaky rowboat. With broken oars. Trying to go up the waterfall. Alligators all around. Hungry lions on the shoreline. It’s not easy putting out a quality print magazine covering non-mainstream music with a staff of fewer than half of what is needed and a budget that leaves no room for error. But great music and people — writers, photographers, musicians, readers alike — make it all worthwhile.